There’s more than one way to own a bright, shiny Jaguar with a like-new feel inside and behind the wheel. If you’re looking to save money on your next performance luxury vehicle, but insist on one that comes backed by the manufacturer, then it’s worth taking the time to check out the selection of Certified Pre-Owned Jaguar vehicles at Jaguar North Scottsdale. Each of these vehicles is no more than six years old, has been driven fewer than 100,000 miles, and went thorough 165-point inspection process. You’ll also get a vehicle history report, as well as roadside assistance and the remainder of the vehicle’s six-year/100,000-mile limited warranty. *Original in-Service date is the earlier of new-vehicle retail sales or in-use date, as reported to or by Jaguar Land Rover North America, LLC. See your local authorized Jaguar Retailer for complete terms and conditions of the limited warranty and service coverage. If you currently or soon will own a new or pre-owned Jaguar, then you know that the premier British automaker that designed and engineered your vehicle insists on quality and precision from the largest systems to the smallest components. At Jaguar North Scottsdale’s service department, we do the same. We have a team of trained and certified service technicians, who specialize in Jaguar vehicles, and we can take care of all your standard maintenance and major repair needs. Schedule a service appointment with us or bring your vehicle in at any time. 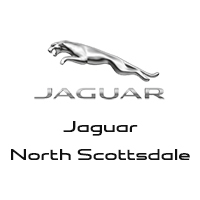 Thank you for taking time to check out Jaguar North Scottsdale, where we offer a wide variety of new Jaguar vehicles to our customers and provide discerning Arizona drivers with some of the most luxurious and high-performance vehicles in the world. You’ll also find a variety of pre-owned vehicles on our lot and in our showroom, from Jaguar Certified Pre-Owned models to hundreds of used luxury cars from other manufactures. We work with each of our clients to help tailor an auto purchasing and ownership experience that’s perfectly in line with their desires and needs. This includes a fast, easy, and competitive financing process for those who want to take out a loan through us. You’ll also have access to our service department for all your Jaguar maintenance, repairs, and parts needs. Find out why so many people count on Jaguar North Scottsdale for all their performance and luxury car desires. Visit us at 18100 N Scottsdale in Phoenix, AZ, or contact us for details.